Tonight National Geographic Explorer series returns at 8 pm ET with Warlords of Ivory, directed by extraordinary JJ Kelley, produced by John Heminway. 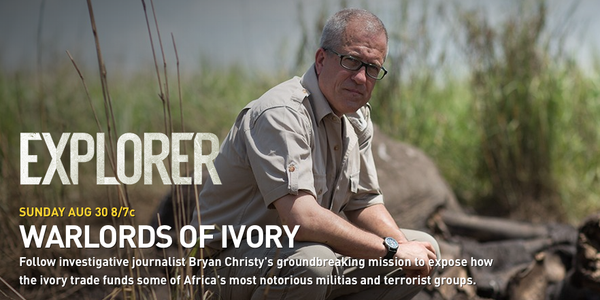 Oh, and I’m live tweeting Q&A after, too (use #NatGeoExplorer). First question: What’s live tweeting? Camera work by Toby Strong, JJ Kelley, Josh Thomas, Pablo Durana. 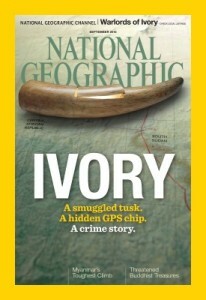 It is also the cover story of the National Geographic September issue by me and photographer Brent Stirton. Categories: Ivory, Terrorism | Tags: Brent Stirton, JJ Kelley, John Heminway, Josh Thomas, Pablo Durana, Toby Strong | Bookmark the permalink.